COMFORTABLE SOMO LAKE RETREAT! 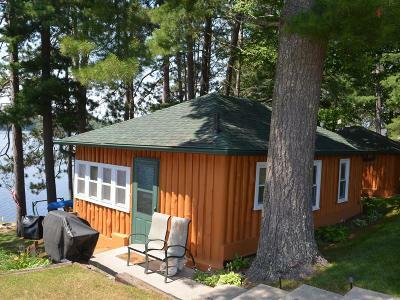 If a traditional Northwood&apos;s cabin is what you seek, then take a look at what we have here. This traditional vertical log constructed cabin offers unrestricted views of Somo Lake and has been remodeled top to bottom. The cabin features 2 bedrooms, bath, open living area and an eat in kitchen. Exterior updates include the roof, gutters, landscaping, and paint/stain. The interior updates include a total remodel that features a new kitchen, bath with shower, knotty pine walls throughout, electrical, flooring and windows. The cabin is part of the Tomahawk Lodge Condominium. You share over 3 acres of land and 475 ft. of sandy frontage on Somo Lake. Each unit has a 10 ft. owned perimeter area that you can dress up to your liking. The cabin shares a storage shed with 3 other units. Easy access to the lake right out your door and the kayak rack, picnic table and the swing are included. Come and feel the stress melt away.